"What are Sacramentals?" While they are similar in name, Sacraments and Sacramentals have a unique and distinct role in the life of the Catholic Church. The seven Sacraments are outward signs that give grace to those who receive them in a worthy manner. 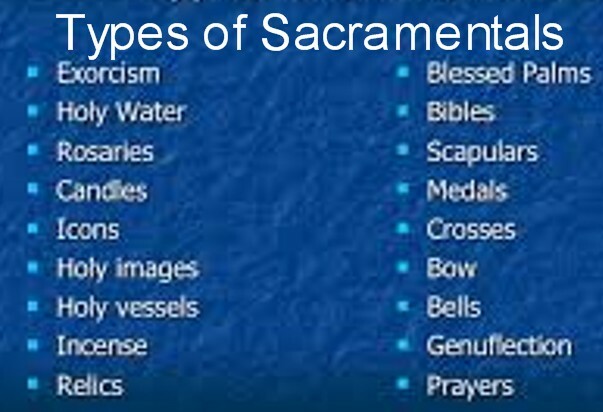 Sacramentals are sacred signs instituted by the Church which bear a resemblance to the Sacraments. They prepare us to receive the fruit of the Sacraments and sanctify different circumstances of life. Sacramentals do not confer the grace of the Holy Spirit in the way that the Sacraments do, but by the Church's prayer, they prepare us to receive grace and dispose us to cooperate with it. Among Sacramentals, Blessings (of persons, meals, objects, and places) come first. They include both praise of God for His works and gifts, and the Church's intercession that they may be able to use God's gifts according to the spirit of the Gospel. For example, the blessing at meals is a chance to offer God a prayer of praise and thanksgiving. It makes holy the mere need for nutrition and is a reminder of the most blessed meal, the Eucharist. The religious sense of the Christian people has always found expression in various forms of piety, such as the veneration of relics, visits to sanctuaries, pilgrimages, processions, the Stations of the Cross, the Rosary, medals, etc. Sacramentals are often a stumbling block for non-Catholics who don’t understand their need. For instance, before his conversion to Catholicism, Dr. Scott Hahn was a staunch anti-Catholic Presbyterian minister. In his talks, Hahn often tells the story of how he discovered his grandmother’s rosary. His grandmother had just died and Hahn relates that he ripped the rosary beads to pieces pleading to God to set her free from the chains of Catholicism that had kept her bound. Today, the internationally recognized Catholic author and speaker couldn’t be more of a supporter of the Blessed Virgin Mary and a promoter of the Rosary. · In the Old Testament, Naaman went to Elisha for a cure for his leprosy. Elisha told him, “Go and wash seven times in the Jordan, and your flesh will heal, and you will be clean” (2 Kings 5:10). · When the man came in contact with the bones of Elisha, he came back to life and rose to his feet (2 Kings 13:20-21). · Jesus healed the blind man using mud (John 9:6-12). · The woman with hemorrhages was healed by touching Jesus’ garment (Luke 8:44). · In Acts 19:11-12, it is recounted that when face cloths or aprons that had touched the skin of Paul and were applied to the sick, diseases were healed and evil spirits released. Sign of the Cross — St. Paul states emphatically, “May I never boast except in the Cross of our Lord Jesus Christ, through which the world has been crucified for me, and I to the world” (Galatians 6:14). In the Old Testament: “The Lord said, ‘Pass through the city, through the midst of Jerusalem, and mark an X on the foreheads of those who grieve and lament over all the abominations practiced within it. Old and young, male and female, women and children—wipe them out! But do not touch anyone marked with the X” (Ezekial 9:4,6). Blessed Salt: “When you have completed the purification, you must bring an unblemished young bull and an unblemished ram from the flock and present them before the Lord. The priests shall throw salt on them and sacrifice them as burnt offerings to the Lord” (Ezekial 43:23-24). The proper use of Sacramentals implies reminds us of God’s love, mercy, and protection. Thus, to pray with a rosary or cross oneself with holy water is to put on "the armor of faith." Sacramentals often provide a tangible, richer experience of the Faith. They are meant to draw the faithful to the Church’s liturgy and Sacraments, yet realizing that the liturgy is far greater than any of them.